at the conference "Jerusalem in the Russian Spiritual Tradition"
I consider it a special honor to be present among so many distinguished scholars, gathered here in the Holy City of Jerusalem to contribute with their valuable knowledge, research and experience to the success of the conference "Jerusalem in the Russian spiritual tradition", which aims at "becoming a major step in the rebirth and reinforcement of the historical bonds between Orthodox Russia and Palestine". I am present in the capacity of representative of His Beatitude Theophilos III, Patriarch of Jerusalem, Who, due to undertaken engagements, cannot be here Himself, as He would have liked. I am here to transmit to the honorable inspirers and organizers of the conference His thanks for coordinating this initiative with the Holy Church of Jerusalem, so that all things may be done properly. Also, on His behalf, I would like to thank you for inviting our highly-esteemed Primate to address the beginning of this conference. I convey His blessings to all the participants of the conference and wish you success in its proceedings through the enlightenment of God, which all of us seek in every good deed. Whenever speech, be it simple, philological or scientific is referred to Jerusalem, we inevitably come to the world-historic, divine and redeeming events which took place in this Eternal City, along with the lives and sayings of prophets and most particularly the presence of God-man on earth. These events changed the stream of human thought and course, as much as from the point of view of religious conviction, as from theological interpretation of the existence of the human being, his social quest and behavior. Common divine elements, accepted by all humanity, respond to the teachings of the three monotheistic religions, dominating in this rightly named "Holy City", which, throughout the centuries was described and agreed on as the "center of the earth", "God's dwelling", "the place in which the Lord worked salvation" and at last, the highest peak of the Holy Land, where the most essential event in human history took place, the incarnation of the Word of God and the revelation in Him of the centuries-old mystery for the redeeming work for which the prophets spoke. As a unique source of spiritual radiation, the Holy and Eternal City of Jerusalem, imprinted and carved in the hearts of millions of believers of all times, has become a supernatural spiritual magnet, ever attracting Christians in reverence and veneration, who, either coming or living here, feel the intermingling of divine and human, repentance and forgiveness, passion and redemption, burial and resurrection and their own fusion with the God-walked places, bringing about grace and blessing and sanctity. In this spiritual attraction and quest for proof "come and see", it is only natural for Russian piety and mentality, that the Christian faithful come in masses towards the source of Light, the City of God. The Russian people have been strongly and uninterruptedly bound with this City since their conversion to Christianity, as truly testify the writings of Russian chronographers and pilgrims, among which the pilgrim and superior Daniel, who, in his "Guide", in the XII century, describes in detail and with sincerity, everything he saw and lived through, during his journey to the Holy Places. The attachment and reverence of the Russians towards the Holy Land and its center, the Holy City of Jerusalem, was not just the expression of piety of certain individuals and groups of the low and middle classes, who undertook the tiresome pilgrimage of many months to the Holy Places, but a spiritual living experience, shown often courageously and expressed in immense interest on all levels of Russian society, starting from the Tsar, members of the royal family, clergy, aristocracy, government, high class personalities, merchants, artisans, down to the poorest of peasants. All of them regarded the journey to the Holy Land, as a special blessing and high grace, whether as pilgrims or to offer help to the Holy Church of Jerusalem in its efforts placed to safeguard the inalienable rights and privileges of the Orthodox Church in the Holy Places. The spiritual dependence was so great, that Russian diplomacy and foreign policy were often mobilized to the degree, that serious issues of Status Quo in the Holy Places, could serve as a reason to cease inter-state relations and even as causa bellis. This is proved by historic events, which show the magnitude accorded by the Russians to the interests of Orthodoxy in the Holy Places, threatened by the rising demands of other religions and denominations. Their concern for the support, good maintenance and embellishment of the places, sanctified by the presence of our Lord Jesus Christ, was unceasing and vital. To this day, the Holy Church of Jerusalem, keeps the signs of their manifest and impressive generosity and piety, as treasures, as the shining of the spiritual attachment of Russian believers to Holy City and its Orthodox Christian spiritual and ecclesiastical authority, the Patriarchate of Jerusalem. Two main factors played the initial role in the formation of these sentiments and the shaping of the emotional reference of Russians to the special meaning that Jerusalem and the Holy Land of Palestine in general had in the Russian Orthodox tradition. The first was the God-pleasing and beneficiary activities of the Patriarchs of Jerusalem, among whom Patriarchs Theophanes and Paissios played a great role in the XVII century. They hold a special place not only in the ecclesiastical history of Russia, but also of all Orthodoxy, for having put their lives in danger, in order to protect Orthodox Russian believers from the pitiless propaganda of other denominations on the territory of the Russian Empire and also for having pushed for the establishment of theological schools, the correction of liturgical books, customs and pastoral activities in general, and for their efforts to consolidate the thought and doctrine of the Orthodox Church. These Patriarchs were named spiritual guides of the Russian Church. Special mention should be made of the way the Church of Jerusalem welcomed pious pilgrims from Russia, hosting them in the various monasteries of the Holy City. As an expression of brotherly love and hospitality, the Greek monks were washing the feet of the pilgrims with great humility in sign of respect for the difficulties, endured during the course of the journey. The second factor is the Russian Orthodox Church itself, which cultivated great attachment to the Holy Land and educated its faithful on the basis of the Gospel and holy writings. For Jerusalem has a spiritual dimension, as the earthly spot, in which the key events of the redemption of human kind took place, where descended the Holy Spirit upon the Apostles and the Church was established. But more important still, the city is the image of Heavenly Jerusalem, the Kingdom of God, yet to come. It is in this spirit that many Russian pilgrims started out on their long and perilous journey to the Holy Land, understanding that in itself the pilgrimage was not a guarantee of salvation, a passport to heaven, but a feat to be undertaken in the sea of life, a veritable ascension to last for the rest of their lives, a living spiritual experience. The key to the understanding of the Russian fascination for Jerusalem is the Holy Spirit that descended upon the City, breathes life and animates the human race. And it is this same Spirit that gave birth to the Russian soul, expressed in their spiritual tradition and reflected in iconography, literature, music, painting and culture, magnified and echoed in the hearts of mankind. Patriarchal and Synodical letters encouraged pilgrimage and blessed the collecting of money throughout Russia for the support of the Holy Places, as a sign of living concern for the Land of Christ. Tangible evidence of such a policy was the assignment of the Church of the Resurrection in the heart of the Russian capital to host the Exarchate of Jerusalem, which helped to create a direct and strong relation between Russians and Jerusalem, the Holy Tomb and the rest of the Holy Places. The establishment in the middle of the XIX century and functioning of the Russian Ecclesiastical Mission and later of the Imperial Orthodox Palestine Society, with the blessing of the Russian Church, was based on the ardent desire of the Russians to have a closer connection with the Holy Places, to serve the pilgrims, to build hospices for their accommodation and relief, but also to follow Church events in the Holy Land and to be "independently" active, for the benefit of Orthodoxy, an initiative, which raised many suspicions and complains in the Church of Jerusalem, although there were many assurances of the opposite. At any rate, there can be no doubt that the Russian Church blessed the efforts of the Tsars' Empire, as was said earlier, to support the struggle of the Church of Jerusalem and to safeguard its rights in the Holy Places. As a characteristic example of this disposition, it is worthy to mention here, the views of Russian hierarchs, such as Metropolitan Isidor of Novgorod and Petersburg, referring to the "legal and unalienable rights of the Greeks" aad "their ownership of the Holy Sepulchre Church", as well as the memorandum of Saint Filaret, Metropolitan of Moscow, forwarded by him to the High Comissioner of the Synod of the Russian Church, Mr. Tolstoi, in which he stresses among others the following: "I confirm and approve... that the right of ownership of the Holy Sepulchre Church belongs indisputably to the Orthodox Hierarchs of Jerusalem". Beyond the historic and spiritual bonds of Russians with Jerusalem, it is worthy to note the importance of the ecclesiological dimension, which the Holy Church of Jerusalem has in the conscience of the Russian faithful. The Russians consider the ecclesiastical leadership of Jerusalem and each Patriarch, as the guardian and guarantor of the true Orthodox faith, as he is in their religious perception the Bishop of the Holy. Places and is associated with the worthy receiving of the Holy Fire, a universal and glorious manifestation of the Light-bringing Resurrection of our Lord Jesus Christ and consequently of the Holy City of Jerusalem, which "first received redemption of sins through the Resurrection". Precisely this initiative and spiritual orientation of Russia towards Jerusalem and the Patriarch of the Holy City, serves as the base of influence of the Church of Jerusalem on the formation and evolution of the services that prevail in the Church of Russia, and the adaptation done by the Russians, of the order of holy services and lives of saints from the Church of Jerusalem to their own. This burdensome but also sacred and spiritual heritage that lies in Holy Jerusalem is preciously kept by the local Church, and has influenced the Russian soul and tradition, binding it with the unique and legal Orthodox leadership of the Land. It is for this reason the Church, through the enormous efforts and immence sacrificies of the Brotherhood of the Holy Sepulchre, struggles by all means to preserve the Holy (Places, as a divine inheritance for all Christian believers and consequently for the pious Russian brothers and at the same time, strives to safeguard for the centuries to come the rights and privileges held in these places. 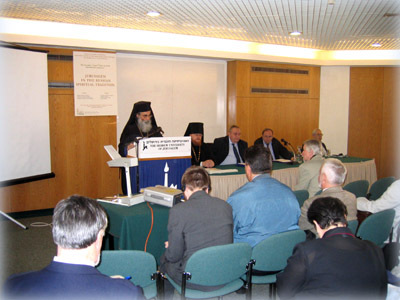 In this struggle, the local Church welcomes the compassion and assistance of all sister Orthodox Churches, organizations and individuals, spiritually attached to Jerusalem. Nevertheless, if intentions are truly sincere, God-pleasing and express Christian solidarity, it is always imperative to coordinate any initiative with the Patriarchate of Jerusalem in order to comply with Church order and maintain unity in Christ. Only thus, the candle of Orthodoxy will remain lit in the Holy Places, and the Church will be able to uninterruptedly carry out Her holy mission and the holy services for the blessing and sanctification of all pious Christians. I am deeply convinced that the love that all of you have for the Holy City of Jerusalem, the cradle of the three monotheistic religions, will motivate you to contribute your utmost for the success of this conference, convened in the church jurisdiction of the Patriarchate of Jerusalem. Once again kindly accept the congratulations and best wishes of His Beatitude Theophilos III, Patriarch of Jerusalem, the Head of the Mother of Churches, in the name of Whom and at Whose appointment, I greet the beginning of this conference.